An interesting article aired Thursday on Public Radio International’s show, “The World,” described increasingly serious problems that Ugandan and other East African farmers are having maintaining healthy coffee trees. Coffee is a major export crop for Uganda (about $450 million per year according to this article from Reuters, half of Uganda’s export dollars) and an important source of cash for many small Ugandan farmers. Coffee requires a predictable and narrow range of temperature and rainfall conditions. Increased severity of droughts and floods, and slowly increasing temperatures, thought to be related to climate change, has reduced bean production and is contributing to more diseases in coffee trees. 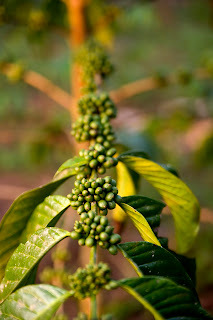 Farmers can adapt to some changes, for example by growing coffee under shade trees, but it is widely believed that changes will eventually overwhelm the farmers’ ability to adapt and wipe out huge areas of coffee production. Here in the United States and in other parts of the developed world, we often argue about climate change from an abstract, political perspective, but what many don’t understand is that if you are a subsistence farmer in a developing nation like Uganda, a single crop failure is disastrous, wiping out your only source of income for an entire year. Without the small infusion of cash from selling a few bags of coffee beans, you may not be able to buy enough food to eat, let alone pay tuition for children to attend school. Many families rely on these tenuous sources of income and for them, changes in the pattern of rain and drought are catastrophic. The PRI article ends with a quote from a Ugandan farmer praying for divine intervention because “coffee farmers can’t control the weather.” Sadly, the weather may be out of control precisely because we have chosen not to keep change in check by reducing our carbon emissions in the developed world. All of the parents of children at the Kukanga School (One School at a Time’s current partner) are subsistence farmers, earning less than $1 a day. Climate change is making it much harder for them to farm. If they don’t have successful harvests, they don’t eat and their children don’t eat. Hungry children can’t learn as well at school. So… the actions or lack of action by people of developed countries affect the people in developing countries profoundly.